The professional audio interface for iOS made for AudioTools. Featuring phantom powered mic input, balanced line input and output, digital audio output, internal battery, and iOS device charging. Announcing the all-new iAudioInterface2. Designed from the ground up to work with all of the current Apple iOS products, iAI2 is the perfect companion to AudioTools, and the perfect stereo audio interface for all your iOS apps. Internal li-ion battery, draws no power from your device. When charging with the included universal power external adapter, also charges your attached iOS device, including iPad. The iAudioInterface2 device also comes with a USB cable and can be used with computers (including Windows PC and Apple Mac) and other devices such as Android smartphones and tablets at sample rates up to 48kHz / 24bit. 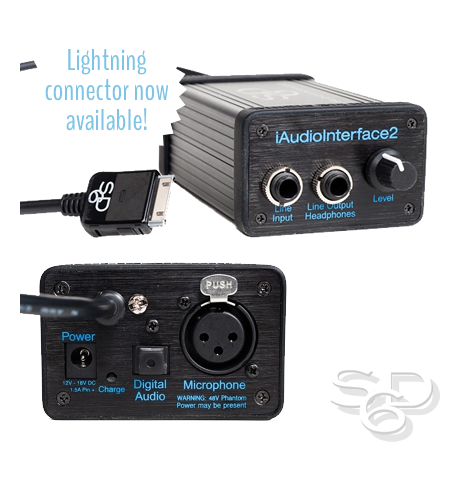 iAudioInterface2 is available with the latest generation Lightning connector or previous generation 30-pin connector.